There are many reasons that the veterinary technician career path is one of the most popular in the animal industry. The vet tech profession has grown exponentially in recent years, and demand for qualified technicians remains strong. Here are some of the pros and cons of this very rewarding, but demanding profession. There is a strong demand for veterinary technicians. The projected rate of growth for the profession is 30 percent through the year 2022. A veterinary technician should have no problem finding a job with such sustained demand for the foreseeable future. The nature of veterinary work virtually guarantees that no two days are alike. Technicians get to perform a wide variety of procedures, see many different patients and interact with a dozen or more owners each day. 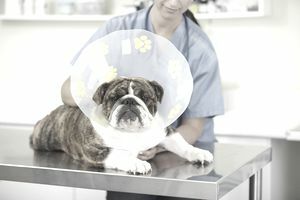 There are usually opportunities for advancement in the veterinary office. Technicians may be promoted to a supervisory role over time (either working as a head technician or in an administrative position such as veterinary practice manager). They may also advance their careers by achieving a specialty certification that can lead to a higher salary and more specialized duties. Working with animals in hands-on capacity is a huge selling point for this career path. Veterinary technicians have constant interaction with their patients ranging from general exams to post-surgical care. The clinic can be a stressful work environment. Technicians must be able to deal with upset owners, aggressive or uncooperative animals, euthanasia, and seeing severe injuries caused by trauma or neglect. Stress is one of the biggest factors cited by techs that decide to leave the profession. You won’t starve working as a vet tech, but you are likely to only make a moderate salary for your efforts. Even techs with specialty certification do not earn particularly large salaries. And, many veterinary technicians work longer than the traditional 40 hour work week. Many clinics are open on Saturdays, and some clinics are open 7 days a week. Emergency clinics may be staffed around the clock. Even in a clinic that keeps more traditional hours, there are often occasions where they are understaffed, resulting in mandatory overtime work. One of the biggest drawbacks to this and many other hands-on animal career paths is a higher risk of being injured at work. Veterinary technicians must work with animals under considerable stress from injury or being in an unfamiliar environment (and sometimes both of these things play a role simultaneously). A tech must be very careful to avoid bites or kicks from their patients, taking extreme care to handle and restrain animals properly at all times.